Published May 11, 2018 by Addison-Wesley Professional. 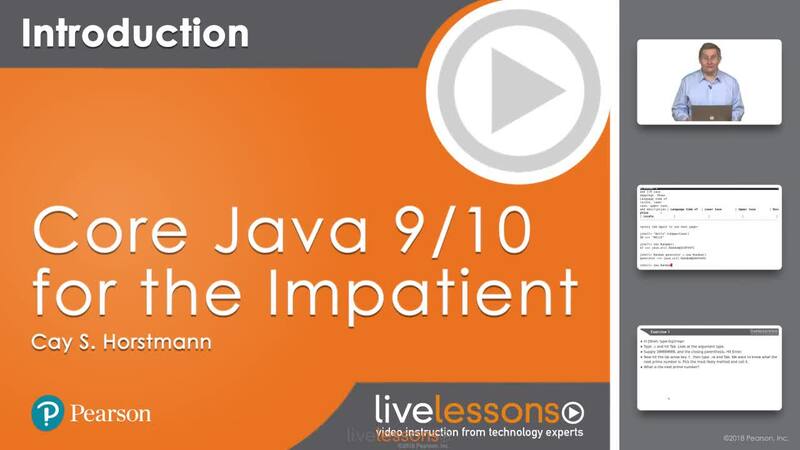 Core Java 11 for the Impatient LiveLessons is a concise guide that covers all the latest changes up to Java SE 11, including Single File Launcher (if your program is contained in a single file, you don’t need to compile it first), the standardized HTTP client API that supports both HTTP/1.1 and HTTP/2, and useful new methods introduced in Java 11 like String strip(). This training pairs with the second edition of Core Java® SE 9 for the Impatient, which was fully updated to cover Java SE 9 and 10. Horstmann’s practical insights and sample code help you quickly take advantage of all that’s new, including Java SE 9’s “Project Jigsaw” module system and the improvements first introduced in Java SE 8, including lambda expressions and streams.